With The Bends, the Brit rockers were no longer condemned to one-hit wonder status. Setting withered, angst-riddled lyrics to soaring melodies, singles "High and Dry," "Fake Plastic Trees" and "Street Spirit (Fade Out)" would go on to be alt radio staples. 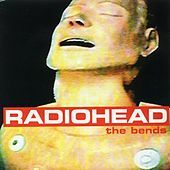 The fact that they're probably the most downtrodden songs on this album, also gave Radiohead the label as one of the world's most depressing bands. Here, they teeter on the line between the grunge inspiration of their debut and the expansive, nimble and technical musicianship of what would come in their future.